I joined Aurora Periodontics in May 2014. 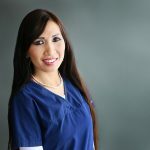 I am a Vietnamese-American hygienist and I graduated from my dental hygiene program in 2006. Since then, I have been providing excellent care for thousands of patients throughout the Denver-Metro area. I am empathetic in character and I provide expert care to ensure that my patients are satisfied. I joined Aurora Periodontics in August 2017. I have 20 years of experience in the dental field. I started out as an assistant then became a hygienist in 2005. I love that I get to help so many amazing people. I genuinely care about each persons individual needs and I help them attain their best periodontal health. I am proud to provide exceptional care in an office that upholds the highest standards. In my free time, I enjoy hiking, strength training, and traveling.